Disclaimer: This is actually my first ever written gear review. I will try to cover everything, but would love your feedback on how I did so that I can create better reviews for other products in the future. For my first gear review on the site, I wanted to cover a product that I have not seen much coverage on, at least in the world of mountain running. The Elevation Training Mask 2.0 from Training Mask (based out of Cadillac, MI which, coincidentally, is the birthplace of yours truly) is a very popular training tool in the world of MMA. More recently, you may have even heard about football teams using them to prepare for games being played at high altitudes. Despite adoption in other sports, I haven’t really heard of many people using them in mountain training. 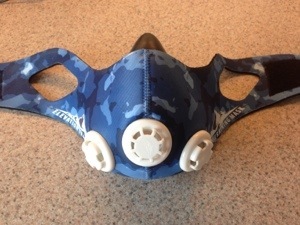 Now you might be thinking, “you live in Salt Lake City, why do you need an altitude training mask?” Well, while I do love mountain running, I am not much of a winter sport guy. Yes, I dabble in snowshoeing, but that is about the extent of it and only occasionally at best. As a result, I don’t get a lot of high elevation mountain time in during the winter to prepare me for the racing season. So, as someone that likes to experiment with gear and needed a solution, I decided to order one and put it to the test. 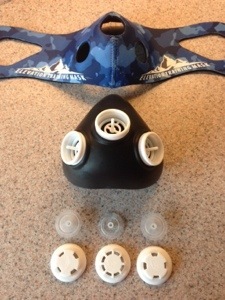 The mask “simulates” high altitude through the pretty simple concept of restricted airflow. Obviously, at high altitude, less oxygen is reaching the lungs per breath. The same holds true (at least that is the claim) with restricted airflow. In other words, with each full breath, you are getting less air/oxygen with the mask then you would under normal conditions. The mask uses (3) valves, each of which can be independently configured, to allow varying degrees of air flow to the mouth. This allows the user to simulate anywhere from a 3,000 – 18,000 ft. altitude adjustment. The higher you are, the less dense the oxygen is in the air. So, with each full breathe you take, you are getting less oxygen. This mask isn’t going to do that. Instead, it creates a restricted air flow scenario, where it becomes harder to breathe. So this mask isn’t ACTUALLY simulating altitude, but I do believe it has some other benefits. It seems to be beneficial. During workouts, whether running or cross-training, the workouts seem more taxing and produce a similar feeling to high levels of exertion at altitude. I have been using it as part of my winter training all season and have already shown that despite being only March, I am running faster with less effort than in previous seasons. This could be a result of a number of factors of course, but outside of using the mask, I have changed very little to my winter training approach. As a side benefit (and maybe the most beneficial for me), my breathing pattern has become much more consistent. While wearing the mask, it is difficult to take quick, short breaths. As a result, I have found that the mask forces me into the habit of taking consistent, long, deep breaths. 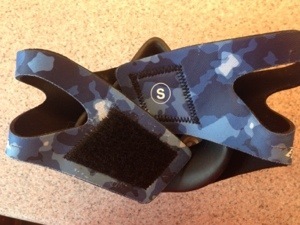 The neoprene masks are stretchy in nature and connect in the back of your head using Velcro. I started with a size Medium and because of this, it bounced just enough on my face to be annoying. I ordered a size Small and the issue when away. Lesson learned, order a size smaller than you think you wear. The sizing only applies to the neoprene sleeve and not the mask itself. I often maintain a beard in the winter months. I found that if I let it get too long, it impacted the seal between the mask and my face. It was only an issue if I didn’t keep my beard trimmed, which I normally do. Not everyone can afford to shell out the cash to buy an altitude tent or some other high-tech altitude training equipment. I found this to be a great alternative. My personal experience and early season performance gives me a high level of confidence that it works as a cost effective training tool. Even if it does not directly translate to pure altitude training, it has made my workouts more challenging and productive, which has helped to improve my overall fitness and technique. It has become a frequent partner in my workouts (I usually use it 1-2 times a week) and I intend on sticking with it well into the future. This entry was posted in Gear Reviews by Ultrarunner Joe. Bookmark the permalink. 2) With the mask, the oxygen concentration is same as sea level, but the air intake volume is reduced. The total absolute amount of Oxygen intake might be the same if the mask is calibrated correctly, but i am not sure whether the effects are the same. It’s a bit like, low concentration salted water taken in bigger volume is very much different from high concentration salted water taken in small volume. I have been using this for about a year now. I can tell you that it does nothing to simulate high altitude because the only way that can be done is with a full respirator removing 10-20% of the oxygen from the air as you breath it. What this does do is put a added tax on your respiratory system. You mentioned your breathing pattern has improved. I also have had this happen. The mask really forces you to have correct/upright posture when running so you can effectively get the most out of each diaphragm contraction. Because of this, you really focus on training your breathing and getting the most out of each breath (i.e. : three steps on an inhale two on exhale). After training with the mask for a while, you’dd notice at race time you’re able to run faster and longer because you are able to really control your breathing in a way you previously have not been able to. For us low-landers, it may feel like high altitude, but it’s not. It’s simply harder to breath so you force all of the muscles associated with breathing to strengthen and become more efficient. thank you so much i was looking so hard to find and see if the beard would affect the mask. so now i know that i need to trim it and not have to shave it all. Thanks for the review. On the “trimmed beard”, what do you think is the longest length that it would still work with? Since my review, I have found it to work on a longer/thicker beard too. I think the biggest factor is comfort, especially once you start to get a bit sweaty. If you can deal with that, it should be fine.